Fullcourt (and crosscourt) dribbling drills. 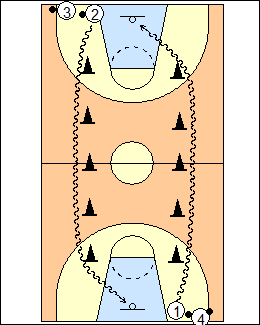 3-4 lines of players on the baseline, each player with a ball, in front of lines of 4-6 cones (lines of 3 cones are used in the video, shown). - mixed moves, don't use the same move two cones in a row. Explode out of each move. 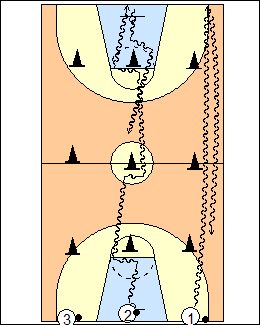 The same drill can be done across court and back (4-cone lines are used in the video). Tara VanDerveer - jump stop at the far sideline, pivot and come back. See Dribbling - Procopio ballhandling, Corridor, Fullcourt zig-zag, Memphis, 55-second. - behind the back (wrap the ball around to the other hip, alternate hands). Accelerate out of each move. 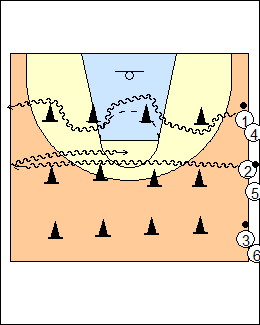 See Dribbling - Speed course, Fullcourt zig-zag, Tony Watson series (fullcourt, commando), Coach Rock cones (Transition).